Here’s a product I wanted to blog about after the first use, but thought I owed it to my readers to really test it out. After losing a close friend to breast cancer, and knowing too many women who have battled it, I have long been suspicious of anti-perspirants and their suggested link to the deadly disease. It just seems too unnatural to literally block sweat from exiting your body in one of the main places it wants to do it. While the jury is still out on whether the active ingredients in anti-perspirants (aluminum-based compounds) contribute to the development of breast cancer,* I chose to play it safe more than a decade ago by switching to deodorants only. That said, I never was–until now–satisfied with their performance. Some were goopy, and some were sticky, but more importantly, all seemed unable to keep me feeling relatively dry and odor-free for an entire day. In my pursuit of the best natural deodorant, I have tried nearly everything available in a natural foods stores (Tom’s, Kiss My Face, Desert Essence, etc.). All couldn’t last a normal day or any type of strenuous work or particularly stressful situation (e.g., running through the airport trying to catch a flight). 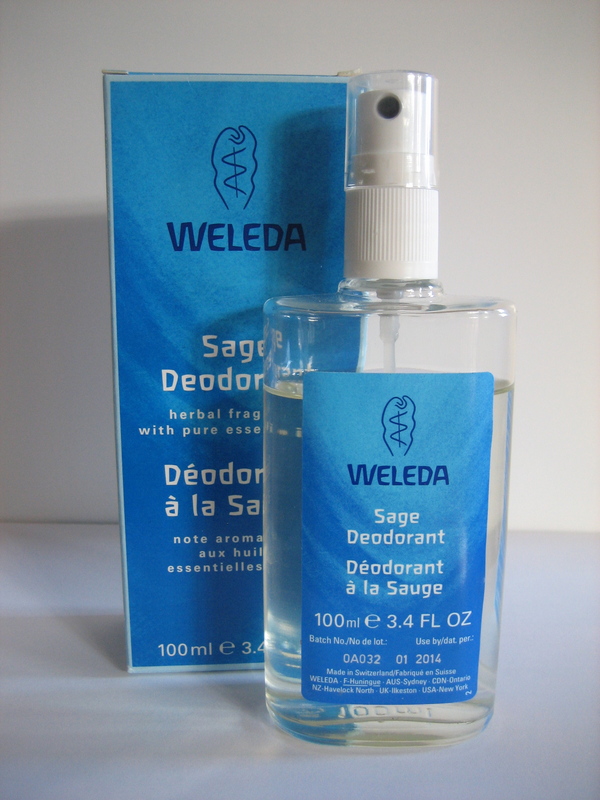 Approximately three weeks ago, I tried Weleda’s Sage Deodorant. While my expectations might arguably have been low, I was literally shocked by how good this product performed. It hasn’t just kept me smelling good doing desk work and going about a quiet day. It has kept me from smelling bad even after a 2-hour power hike up the mountain, working in the garden and running through the airport to catch a flight to L.A. This deodorant is the best–without a doubt–of any I’ve tried. It comes in a glass bottle with a non-aerosol pump that delivers a concentrated spray. Although wet at first, it dries quickly due to its alcohol content. It leaves no visible residue nor anything you can detect by touch–making it superior to any product I’ve ever tried–deodorant or anti-perspirant. And it’s subtle herbal scent makes it truly unisex. It’s not completely natural, but the ingredients are relatively benign even to those with the most stringent standards (e.g., the Environmental Working Group link). You can find it in many natural food stores, including Whole Foods, as well as on-line. I recommend this product to everyone! Thanks for posting this. I’ve been looking for a safe and effective deodorant for a long time. I went out and got the Weleda Rose scented deodorant (more my style than the Sage) and so far it works great! Really? It has a score of 5, and even includes possibly cancer-causing compounds… The EWG lists so many other products well below a 5! It does stink that Weleda generally doesn’t fare so well by their listings, as I do love their products. Good question and thanks for reading my blog! Since I knew that EWG gives each of the ingredients in the Weleda Sage Deodorant a toxicity score of 0-2 (“low hazard”), I did not check the organization’s overall score of the product, which is indeed a 5 (“moderate hazard”). I was, quite frankly, shocked to see that rating–the numbers/data simply don’t add up. What is even more bizarre is that ALUMINUM ZIRCONIUM TETRACHLOROHYDREX GLYCINE found in most drugstore anti-perspirant/deodorant brands has been found unsafe (toxicity rating as high as 7 depending on use) and is prohibited or restricted in cosmetics by the FDA. EWG provides information about this ingredient in their Cosmetic Database (within Skin Deep), but fails to include it in their Chemical Index where you get the really good information, such as specific toxicity scoring and references to actual studies conducted on the ingredient. Furthermore, these drugstore-brands also contain petroleum products and synthetic fragrances. Conclusion: While I generally consider the EWG to be my “bible” concerning product safety, it clearly is not without fault. And similar to the actual bible, the EWG’s reports were written by “man”–hence the numerous errors and incongruous statements. I have written to them asking for clarification (i.e., how do four ingredients rating 0, one rating 0-2 and one rating 1 add up to 5). I will post their response as soon as I receive it. I just bought Weleda’s Wild Rose Deodorant, and it looks like EWG gives that a 7! I’m curious to know whether you continued using the sage-scented one. I like the smell of the rose one and don’t know how seriously to take the 7 label.